We are looking for the peanut and find it on a side street in a dinky town in Georgia. 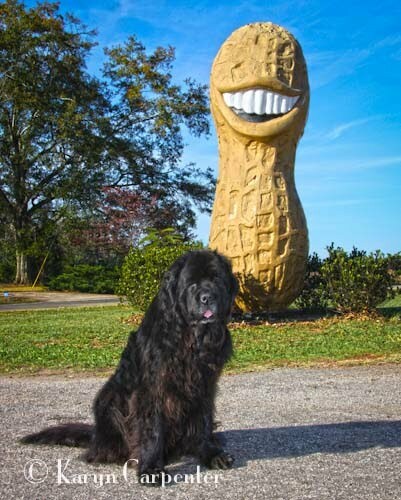 The lady had said "Look for the big peanut with Jimmy's face on it!" And, there it was - on a corner of a parking lot in a residential area of Jimmy Carter's home town - a 13 foot tall goober with a big toothy grin. The drive from South Carolina to Mississippi was uneventful, though long. As Arayo and I drove our normal backroads through America's south, I asked myself if there wasn't something I was missing? Surely this part of the country had something to offer as a side attraction. 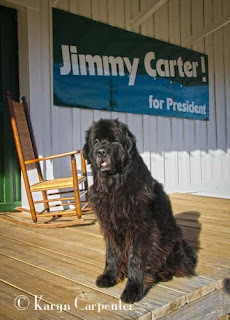 The only thing of note that came to mind was that Jimmy Carter was from Georgia. But, what were the odds that we were anywhere near Plains? After all - we had already driven the majority of the way across the state. But a visit to Jimmy's hometown was meant to be as we were 15 miles away and my route could easily take us through the home of our 39th President. Now, I have to admit - when Jimmy was in office, I thought he was a dork. Though, hindsight proves that it was me who was really the idiot. I freely admit it. The more I know about the man, the more I respect him. In my opinion, Jimmy Carter may be the last president this country has had with the guts to lead with his conscience. Hell, he may be the last President who HAS a conscience. No wonder he didn't make it in Washington. Jimmy Carter came from simple roots. His first restroom was an outdoor privy, water came from a hand-cranked well. As a kid, he ran barefoot through the muddy fields and began selling boiled peanuts at the age of 5. He learned about joblessness and hunger from the tramps that knocked on his door, asking for water, or a bit of food. Something his mother always gladly shared. While President he begged Americans to pull together during the energy crisis, doing his part by throwing on a sweater and turning down the heat in the White House. He wasn't asking us to do what he wasn't prepared to do himself. In July, 1979, he addressed the American public on television and warned Americans that too many of us were worshiping self-indulgence and consumption. "Human identity is no longer defined by what one does, but by what one owns," he said. He encouraged people to fill their lives with meaning and purpose. Carter declared amnesty to Vietnam draft dodgers, encouraged energy conservation, installed solar panels on the White House and - curses of all curses - he boycotted the 1980 Summer Olympics in response to the 1979 Soviet's invasion of Afghanistan. Not a decision that earned him brownie points, but for a man leading with his conscience - it was, I believe - the right decision. His time in the Presidency was too short. A man who takes the high road isn't going to have a good time of it when he's dealing with the bottom feeders of Washington. But, out of office, now, 30 years, Carter has continued to work tirelessly for human rights. At 86 years of age, he is still an inspiration and living his life with purpose. He and Rosalynn, his wife of 65 years, continue to live in the home they built years ago in Plains - population 637. He teaches Sunday School at his local church, takes his turn at the church lawn maintenance, and still advises on the international scene. Jimmy Carter - thank you for being a real stand-up guy!